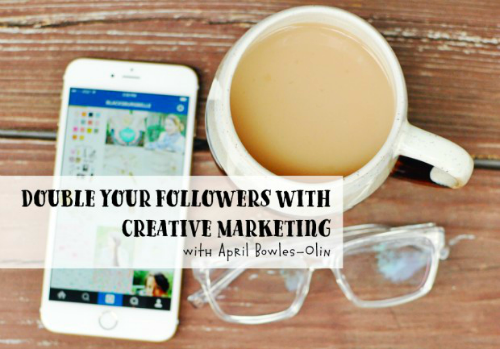 This post is a part of the Double Your Followers blog tour to spread the word about April Bowles-Olin’s upcoming CreativeLive course. Does hearing the word ‘marketing’ make your armpits start to drip with anxiety? Are you terrified of sounding salesy or like you have the personality of a dead blowfish? If so, come join me and 2,500+ entrepreneurs who’re taking April’s latest CreativeLive course, Double Your Followers with Creative Marketing. You can RSVP and watch for FREE. Yep, free. High fives, wildflowers, wine samples. Who doesn’t love free? When I first started my business almost 3 years ago, marketing was extremely difficult for me. I’d write what I thought were brilliant and insightful blog posts, but then no one would show up to read them. I shared the links to my posts on Facebook and Pinterest. But still nothing. No readers, no shares, no comments. Just crickets. Not surprisingly, at this time I also had no clients. If I was ever going to make it as a life coach, I knew I had to do something about my marketing. It was time for drastic action! I was super confident that I could help others, but there’d be no one to help unless I could somehow figured out how to get people to realize my business existed. Since I didn’t have anything else to do during the day (remember, zero clients), I decided to spend every second I could getting in front of the people I wanted to hire me. After coming up with an extremely detailed client profile (ie, who I wanted to work with), I went in search of where those folks hang out. Then I left helpful comments on at least 80 other blogs per day. And you know what? It worked. BIG TIME! I was getting anywhere from 30-60 new subscribers daily, my blog posts were finally getting noticed, and I finally got paying clients. The best part was that these new followers were handpicked by me through my commenting efforts. I’m in control of my business, and it’s up to me to court my ideal customer. Commenting has transformed my business from a struggling startup to a thriving 6-figure coaching practice. I don’t comment 80 times per day anymore, but commenting is still a huge part of my ongoing marketing plan. But when I suggest commenting to my clients, I get a lot of pushback. They think it’s going to be difficult or boring. OK, commenting isn’t the most exciting thing you can do, but it works. So do you want to be a proactive leader of your business? Or do you want to keep waiting for people to find you? You can do this! But first, you need to find blogs to comment on. Google searches. Type in the kind of blogs you’re looking for such as “crafting blogs” or “productivity blogs.” Look for blogs where your ideal customers hang out, not your competition. This is why I rarely comment on other life coaches’ blogs. Comment sections. Scroll down to the comment sections on your favorite blogs. Most of the people who leave comments have their own blogs. Click on the link to their blogs (usually their names) and see if they might be your ideal clients. Feed readers. Feedly, BlogLovin, and other feed readers not only help you organize the RSS feeds of your favorite blogs, but they also suggest other blogs for you to follow. Social media platforms, especially Pinterest. Search on Pinterest for the kind of blogs you’re looking for or for things your ideal clients would search for such as “save time” or “get organized.” Click a pin to be redirected to the blog where it came from and see if the writer is your ideal client. Blog tours and link-ups. Blog tours (like this one!) are excellent ways to find like-minded bloggers all at once. The 31 Days Writing Challenge is one of my favorite roundups of blogs. Start saving your favorite blogs in a feed reader (I recommend Feedly) so you can find them again quickly. Comment sections at the bottom of blog posts are where you can tell people that you have a business and that it’s worthy of their time. Imagine you have a brick and mortar store with a physical location (some of you may actually have a storefront business). You might not get a lot of sales because you’re relying on people to walk by and notice you. But if you hired a teenager to stand in front of the building and tell the passersby how great your business is (“Today only! The coolest gizmos in the tri-county area! Check it out!”), then people would realize your business exists and probably stop in to see what you’re offering. Then when those folks visit your website, they have the chance to sign up to get your freebie and start your sales funnel process. Your comments represent how you run your business, so be professional and helpful. Unhelpful comments are usually one or two words, they don’t offer a new insight or start a conversation, or they’re too self-promotional. Remember, there’s no reason to leave your URL in the body of the comment because your name will be linked back to your website automatically. Here are some examples of what you should and should not say in your comments. When you’re leaving helpful comments, be sure to comment on blogs that are completely new to you and blogs where you want to create a relationship with the blogger, such as someone you look up to or might want to partner with in the future. I call these 2 types of comments “newbies” and “nurtures” and you need to do both to grow your readership. Interacting in comment sections of blogs can also help you improve your content on your blog, in your digital guides, and through the services you provide. It’s time to play detective! When you visit a website, look at what other people in your field are talking about and share your opinion or unique viewpoint on your blog. Do you agree or disagree with what others are saying? Then search the comment sections on yours and other blogs. What questions are people asking? Answer those questions with your blog posts. This is how you get inside your readers’ minds. Lastly, remember that you’ll see the best results from commenting if you stay consistent. You don’t have to comment on 80 blogs per day like I used to, but aim for at least 1 newbie and 1 nurture comment per pay. Don’t forget to install Google Analytics on your blog ASAP so you can tell where your new readers and subscribers are coming from. You won’t get sales if no one knows your business exists. Do you use commenting to promote your blog or business? In the comments below, share how you tell people that your blog exists. THE BACK-TO-BASICS SALE ENDS SUNDAY! 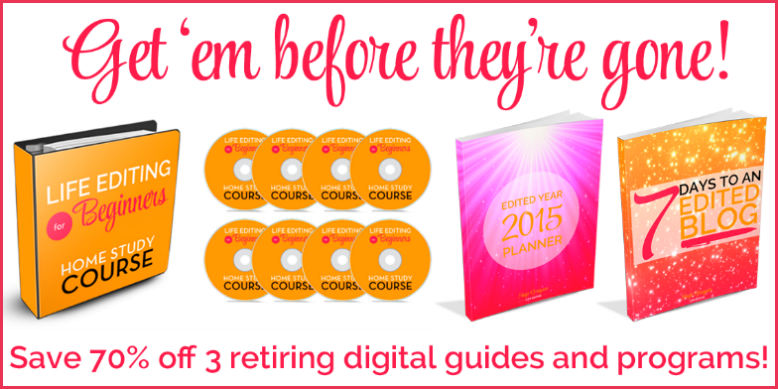 Click here to save 70% off my digital guides and programs. This post focuses on Step 3 of the Life Editing Process, Add Good Habits and Routines. For more about life editing and what it can do for you, click here. Love this advice, especially for new bloggers! When you’re just staring out, there’s not a lot of room in the budget for advertising, so commenting on related blogs is a must. Along with guest posting (which is SO not as scary as it sounds). You know, I’ve been thinking about this but kept putting it off and now I’m doing it! Wish me luck. I think you’re so right about being able to pick likeminded followers by finding out where they go…now I’m just annoyed that I didn’t start sooner. It’s a great way to build community. Wow. That is an awesome tip. I have never heard about that approach before. Am going to try it out for sure. Thank you so much for sharing. It’s hard to start a new business, so any kind of help is appreciated for sure! Thank you! Thank you! That is brilliant. I recently transitioned my business and have been looking for new marketing ideas. I absolutely love this as it’s a way to get involved in the community, promote my business, and get to learn from other bloggers in the process. Sage, this was an awesome post! I really appreciated your steps for Feedly and Pinterest – I use both but not in that way, yet. So I’ve made a to-do list based on what you’ve said and I’m off to start working! This post was great because you gave tips I haven’t seen yet and a very specific to-do which I fully appreciate! Thanks! Yay! I’m glad this info is helpful for you. I absolutely love Feedly. This is absolutely brilliant! I already follow and comment on a lot of other blogs, and through that many of them started reading my blog and some also actually ended up becoming customers of mine, but I read their blogs because I enjoyed them. Now I need to start seeking out blogs of my target customers! Yes, find your customers, leave helpful comments, and watch them come back to your website. It’s a fast and free way to position yourself as an expert. Haha, yeah don’t comment on 80 blogs per day unless you have nothing better to do. 🙂 One or two per day is an easy way to stay consistent. You’re so welcome, Leisa. Try it! Hi Sage, congratulations on being one of the blog tour winners! I found you through April’s retweet. I’ve also been watching the Double Your Followers course on Creative Live. I have only been using social media to promote my business. I will make it my weekly goal next week to comment on as many blogs as I can. Thank you dearly for this golden information! Yes! Leave helpful comments on other blogs and send them back to your website so they can buy something from you! This makes so much sense!. So for me, I would search mom blogs and nursery decor blogs. (I sell custom wall art for children, moms and besties). And I should stop commenting on blogs that sell similar items as me or other embroidery hoop artists. Am I on the right track? Searching for the blogs would be great for target market research so building up to 80 blogs a day seems like a good goal. Yes, that’s right. Comment on blogs where your ideal clients hang out but not ones that are run by your competition. That makes sense! I am willing to give it a try and make a point of commenting on 10 posts poer day till the end of October and I’ll keep you posted on the results! Thanks for the tip, Sage! This is advice I can totally do. I struggle with marketing, and this makes sense to me. I actually used to do that a lot, and I did notice a spike in traffic, but it didn’t click at the time. Now I get it! Try it again and check your Google Analytics to see where the new traffic is coming from. I bet you’ll see that they come from the places where you leave comments. Seriously, how has it not hit me before now that commenting on other sites/blogs is a marketing strategy?!! Sure, I’ve heard that I should do it, but I never thought of it as marketing. I busy myself with all sorts of “important” things I just have to do for my business, but I am severely lacking on the commenting portion of my marketing. I’m going to start trying his out, and see how it will hopefully help me to gather more clients. I suppose actually blogging consistently myself would go hand-in-hand with that as well, so I better get to work! Thanks Sage! You’re welcome! Try blogging once a week consistently and leaving 1 comment per day on other blogs. I’ve heard other people suggest commenting on blogs – and I certainly read plenty! I even blocked out time on a calendar to do it, but didn’t make myself follow through. I read in feedly, but on my phone, so I’m often skimming through and not landing on the actual site. I need to sit down at my desk and make a better effort. Just your ideas to hand pick your audience made a difference in how I’m thinking about this – turning it from more of a chore into a much more exciting challenge. It often takes me a long time to generate what I want to contribute to a conversation, but it will take practice. My other struggle is the items in my feedly are things /I /want to know, not where my customer is, so I’ll need to mix it up more. You’ll get faster the more you do it! Add some blogs that your ideal customers would read into your Feedly too. Wonderful post! While I was reading this post, I thought that I have found wonderful people online by reading comments and clicking their names to find out more about them. And what made me click? They wrote interesting comments relevant to the topic. I will implement this technique as a daily habit. Wow! 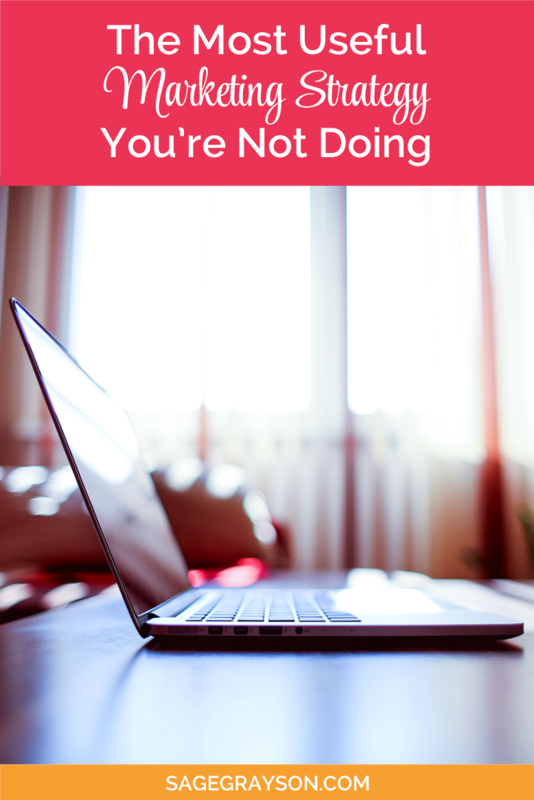 I didn’t realize how much blog commenting you did to get your business going. 80 blogs a day! That is really inspiring. I’m going to up the ante on my blog commenting! Thanks for sharing! Haha! Yes, but I only did that for a couple months in order to build my list up to a place where it could sustain itself. I don’t recommend spending every second on commenting…unless you’re not getting any traffic like I was. I agree with Dana Lynn, I really enjoy reading and commenting (and it gives me a great excuse to read ALL the things!! which I am apt to do). I’m trying to make it consistent though. I seem to go through bouts of commenting and then silence. It needs to become a daily practice. You’re so welcome, Claire. Take it slow, publish some blog posts, and ease into commenting on blogs where your ideal customers hang out. You can do it! Nice to meet you! I’m also on April’s blog tour. I love this post! Your advice is simple and actionable. I had never thought about using comments to help me grow my subscribers. I always hear about doing interviews and guest posting, but I don’t think I actually heard anyone saying about commenting before, so thank you! 🙂 And I love how you’ve nailed those unhelpful comments. I’m just starting with my blog, but I get those on social media all the time and it feels so shallow. See, you’re already a pro at commenting! It really works, and for me, the growth was much faster than when I did guest posts. Oh, how I loved this post! I naturally do this in my marketing efforts, but totally need to work on being more deliberate and consistent. I love your tips on how to find my target readers, especially the 31 days writing challenge! I can’t wait to check it out! Hi Sage, I’ve heard similar advice said in different ways before, but this is the first time I’ve seen it broken down like this. While I do try to comment on blogs often, I admit I haven’t been very systematic about it. This is giving me another perspective for sure. Thanks for sharing! Keep trying! See how many comments you can leave in a week and then compare that to how many new subscribers you get during that same time. It’s always been worth the effort for me! Hey girl! When I clicked on your blog post for the tour, I thought to myself, “this is probably going to be something like guest posting or landing interviews…something most people would think of.” But, no…this is definitely something that most people don’t utilize when it comes to marketing. And, it’s something that everyone can do. We’re all capable of finding blogs that our target market reads and adding valuable comments to the blog posts. THANK YOU for sharing your strategy as a part of the blog tour. I think a lot of people are going to find this really helpful and interesting. And, I think it’s pretty obvious that you were determined to make this work and that’s half the battle. Thank you so much, April! Yeah, a lot of my success has come from me getting over myself and simply doing the work. This has helped me know what to comment and not to comment on peoples blog posts. Also I didn’t know how to find my ideal client and now I do. I had no idea about Feed reader. I would subscribe to a blog posts and wait for their email. All I have really been doing is finding people on Facebook because it was easier. But only really getting their because I took part in a webinar our bought their product. Hi Susan! I’d be lost without Feedly. I don’t have time to check my favorite blogs every day to see if there’s something new, and I don’t want to clutter up my inbox with a ton of email newsletters. Now I can keep everything organized in one place. The blog commenting is great advice I definately want to put into practice, thank you. I dipped my toe in the water a while back but I think perhaps I was not quite choosing the right blogs to comment on and the results were disappointing. Hearing how it worked for you is really inspiring and gives me motivation to give it another try! I feel a brainstorming session coming on! You can do it Katie! Check out the 31 Days Writing Challenge I mentioned above. The blogs are organized by category so it’s easier to find your ideal readers. Thank you Sage for this great tip. I’m going to try it and see. I have my webpage for 8 years now, but just recently I’ve decided to try blogging. It is quite challenging but I’m having a lot of fun. 31 day challenge sounds good. You’re welcome, Eva! The 31 Days Writing Challenge is a lot of fun, and a really great place to find other blogs. Good luck! I have always heard this was a good strategy and wondered how many blogs I should be commenting on for it to be effective. I truly enjoy reading what others have to say and I would not find it boring. I don’t think I can comment on 80 blogs, but it’s nice to know that this kind of effort would be rewarded. See you in April’s CreativeLive class! Yes, 80 blogs per day was a little much, but what else was I going to do to fill my time? I only do a few comments per day now, but massive commenting is an awesome way to grow your readership quickly.